COLORADO SPRINGS, Colo. -- Famous fictional Vulcan Leonard Nimoy says he's excited about what's to come in the world of real-life space exploration. Nimoy, who became famous playing Spock in the original Star Trek series, spoke Thursday here at the 26th National Space Symposium, where he was accepting the 2010 Douglas S. Morrow Public Outreach Award. The actor said he's a big fan of real-world spaceflight, as well as the fictionalized version, and had watched President Barack Obama's major space policy speech that afternoon. "I do believe that President Obama means it when he says that he is 100 percent interested in space," Nimoy told reporters. "I know for sure he's a Star Trek fan," he said, because the first time the two men met, President Obama made Spock's traditional V-shaped finger spread. He even credits real-life space exploration for the success of his Star Trek show. When it was first run, the program wasn't that successful, he said, but began to pick up in reruns after the Apollo moon missions. 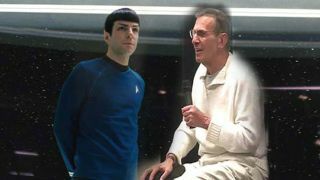 "In 1969 Neil Armstrong stepped on the moon, and I think that had a great impact on Star Trek reruns," Nimoy said. "The show began to find a tremendous new audience."